“It’s easy to get a buffalo to do what a buffalo wants to do,” said a man in cowboy hat as he watched the start of a bison round-up at the Onaqui Ranch in the melting-snow-covered Rush Valley, an hour west of Salt Lake. The ranch is basically a game park for bison. For about $3500, hunters can come with guns, or bow and arrows to shoot a bison for meat. In the distance, we watched a posse of all terrain vehicles blasting over treeless pasture, herding about 30 buffalo in to a plywood lined holding pen. One mama with a calf in tow was chased relentlessly back and forth for miles. The pair deftly eluded the quads slipping through tiny gaps, bolting faster than a thousand pound hunk of bone and flesh should be able to. The calf’s mouth was open, tongue hanging out, panting in exhaustion. I wondered if it might collapse or have a heart attack. Eventually a jeep, a truck and a few humans running with arms comically flailing, were dispatched to help wangle the stragglers. Once the animals were contained in a holding pen, they were herded in groups of two or three through a labyrinth-like chute made of wood and sections of metal gates, fastened together, hopefully very securely. Volunteers, many with no bovine experience, took up positions along on the outside walls of the chute and prodded the bison, poking them with PVC rods and shouting to urge them onwards. In an apparent design flaw, the chute was broad enough for even the heftiest bull to turn around, so a lot of time was spent coaxing nervous giants to change direction, which they did not want to do. At one point two men climbed to the top of the structure and hanging from the overhead bars used their legs and feet in a gesture that can only be called “kicking.” It was hard not to imagine them losing their grips, giving the buffalo and opportunity to respond. In the moments when yelling stopped the air was filled the baritone breaths of the hyperventilating bison. Looking through the slats in the chute I saw wild, desperate eyes embedded in a masses of trembling iron wool. The buffalo were weighed, then pushed into an iron-maiden like device, minus the spikes. Two curved doors clamped down on their necks, holding them in place, inspiring thunderous clangs, kicking and jolting. A hatch opened to expose their fuzzy shoulders, and a volunteer doused them with a surpy blue deworming agent that looked dangerous to handle without protective gear. The rancher reached through the hatch to administer vaccinations. I could see his hand shaking, perhaps in fear, if not respect for the feral power of 2000 trapped pounds. Chet Vernon (L) and Clair Vernon (R) get a bison in a head lock in a chute. Volunteer Chet Vernon prepares to throw a towel over a bison's head, as a blinder to reduce the animal's stress. We do not condone nor will we permit these animals to suffer needlessly due to a customer's poor marksmanship. We reserve the right to terminate the hunt and dispatch the animal ourselves depending upon the situation. The friendly rancher’s wife came over to say hello and kindly offered me doughnuts and chocolate milk. As we were chatting a bull catapulted five or six feet in to the air ripping a chunk of wood out of a fence, she marveled, “It just amazes me how high those beasts can jump, that what I call them, beasts.” I did my best Margaret Mead impersonation, thanked her and the rancher sincerely for the generous access. Once again, I am grateful for the front row seat to life my job affords me. More than ever, I will continue to be mindful about eating meat. I got to visit BYU and take some portraits of LDS African American, students for the Daily Herald. Student Johnisha Demease-Williams, 21 who worked on a video about African American students, at the BYU campus on Thursday, Feb. 28, 2019, in Provo. The video, entitled "We Are BYU" series contains interviews with black students who attend BYU. (Photo by Natalie Behring, special to the Daily Herald). Student Andra Johnson 23, who worked on a video about African American students. Recent work: Federal workers protest government shutdown in Ogden, Utah. Michael Verhey holds up a printed and numbered poster he created at the Moda Center in Portland Friday November 30, 2018. The poster commemorates a game versus the Denver Nuggets. This is where your french fries come from. 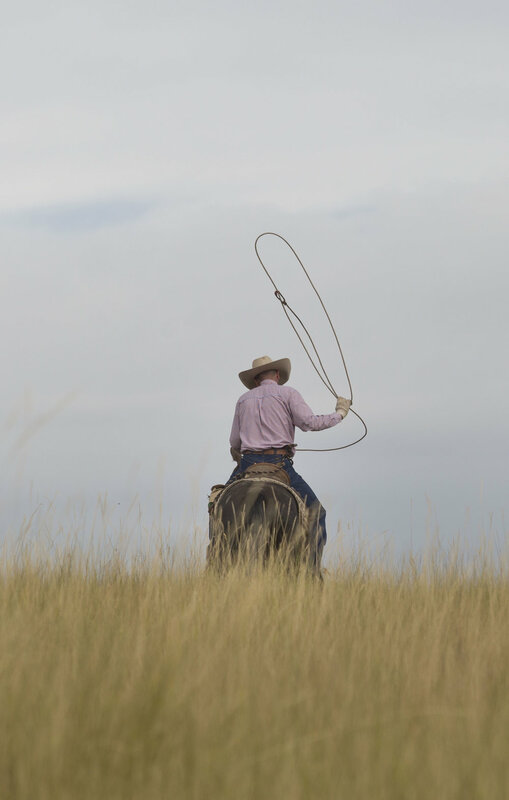 Ranchers Tanner Fuchs and Ryan Asay generously let me follow them around as they tagged new calves on a ranch near Ashton, Idaho. Besides it being stunningly beautiful, they let me bring my dog, who had one of the best days of his life. Ryan Asay ropes a calf. 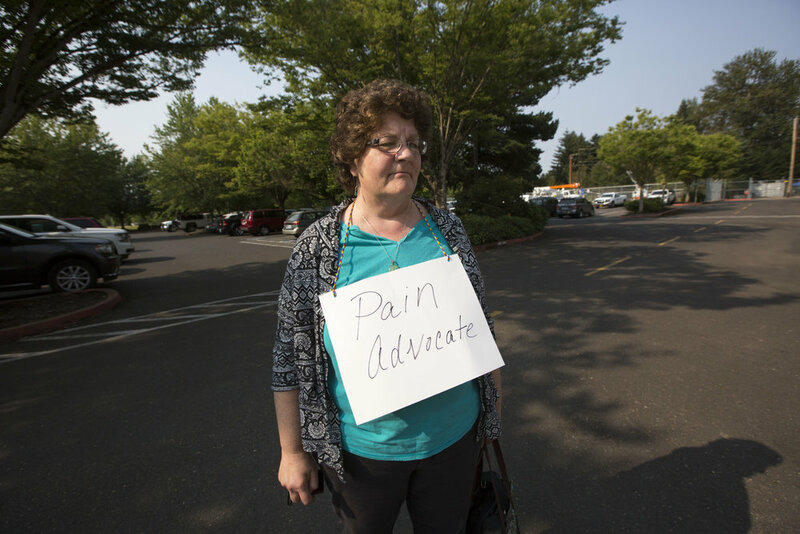 I shot this story for STAT about Oregon Medicaid's proposal to cut off patients taking taking opioids to manage pain for stat with journalist Lev Facher. 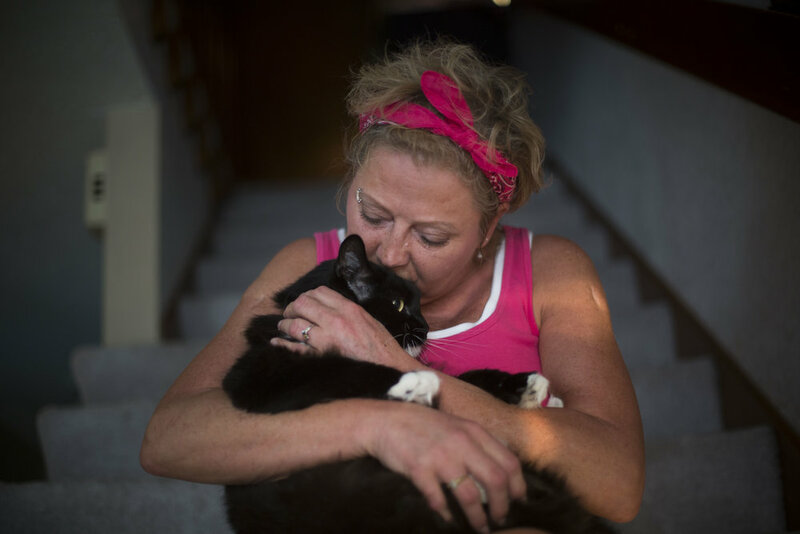 Laura Dolph generously let me in to her home and let me take photos of her life with her cats. Amanda Siebe holds up her bottle of methadone as she speaks at a hearing to discuss the future availability of opioids under Oregon Medicaid rules in Wilsonville, Oregon August 9, 2018. Laura Dolph, who takes opioid medication for pain management at her home in Gresham, Oregon August 9, 2018. Laura has two sizable plastic containers under her bed that contain numerous medications she takes daily. I spent the day following DAX, a delivery robot in Philomath. DAX delivers burritos to the patrons of the local Mexican restaurant. He navigates the sleepy streets of the small town at four miles an hour, and stops to say hi astounded residents. While I was shooting, a woman rolled the window of her car down and yelled, "My 94-year-old mother in law has seen it all now!" An eldelry lady with fire-engine red nails waved and nodded enthusiastically at the robot from the passanger seat.